Disu warns Rohr on tactics against Cameroun – Royal Times of Nigeria. Disu said that the Eagles loss to Bafana Bafana in the AFCON qualifiers was due to wrong tactical formation, adding that the Indomitable Lions of Cameroun would be more tactical. Tunde Disu, former Technical Director, Nigeria Football Federation (NFF), on Sunday warned Super Eagles coach Genort Rohr against wrong tactics against Cameroun in the Russia 2018 qualifiers on September 1. Disu told the News Agency of Nigeria (NAN) in Lagos that the team’s tactical formation against South Africa in the AFCON qualifiers was wrong and should not be used again. He said that the Eagles loss to Bafana Bafana in the AFCON qualifiers was due to wrong tactical formation, adding that the Indomitable Lions of Cameroun would be more tactical. “The formation used by Rohr during the AFCON qualifier against South Africa is wrong tactics. He cannot use a supporting striker as an arrow head when using 4-3-3. “Rohr should know that Kelechi Iheanacho cannot spearhead attack, that is not his role and that is why he is roaming about during the match against South Africa without a shot at goal. “I want them to sit down and analyse the match themselves, that system is faulty because most teams can now predict the formation. If we use that selection and tactics, we will be embarrassed. “Rohr should align with the modern tactics of play rather than stick with the old play which will not benefit us. We are too predictable now. Disu said that the players at the disposal of Rohr were good enough to accommodate another formation which was less probable to opposing teams. “We cannot continue to use the 4-3-3 formation, it’s outdated and counterproductive. We should rather play 4-2-3-1 which is far better for the defenders. “The players determine the system and not the system that determines the players. It is better to have two defensive midfielders in front of the defenders, maybe if there is an overlapping one. “Playing 4-3-2-1 formation also means that we need intimidating strikers like the late Rashidi Yekini to torment the opposing teams. We have Gbolahan Salami before but I don’t know if he is not called. “The lone striker may be very tall and strong to hold the ball up as his midfielders while full-backs join him in attack. The striker could also be very fast. “African soccer is more physical and there is need for us to have a strong striker in the manner of Salami that can torment the defence of our opponent,’’ he said. Disu warned Rohr to be wary of Cameroun threat could pose to the Eagles’ qualification, adding that a loss to Indomitable Lions would close the qualification ticket. “I want the coach to be careful with the Cameroonians so that they will not scuttle our chances; any defeat to them closes the qualification ticket. “It does not matter where we are now because we won’t be begging Cameroun to lose any of their games after defeating us. “The Indomitable Lions are in form now and they are using the modern formation. Rohr needs to change that formation or else we will be out of contention. “To beat those indomitable Lions, a very good top 9 will be a good option and not necessarily to score goals but to torment the defence line and maybe to create chances for others,’’ he said. 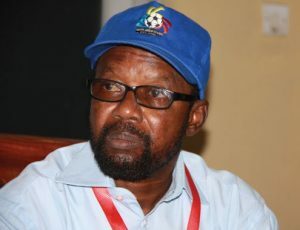 Disu said that other countries and clubs have been winning through the golden formation, noting that countries that had yet to play the style were lagging behind. “I want to give the example between Spain national team and the Germans. The Germans are more tactical in their formation and are not playing false 9 like their Spanish counterparts. “The golden formation continues to have the upper hands. In these cases, the opponent’s defense will be forced to fall back early, thereby leaving space for the offensive central midfielder. “Rohr does not need to inject fresh blood into the team but play within what he has to achieve better results. We are blessed with players that can suit the golden formation. “The coach should also have two options in which he can switch and Iheanacho should drop back for a strong striker for him to be effective,’’ he said.